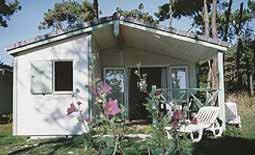 At the "Parc du Guibel" we have a wide range of high quality accommodation for hire. All of our models come equipped with a shower room, WC, hot plates, oven, fridge, dishes, bed covers, pillows, garden furniture and sun tops (sheets can be hired). 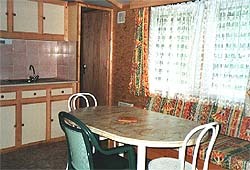 Mobile homes are available measuring between 24 m² and 40 m² and comprise a sitting area with cooking area, a pull-out double sofa bed, 1, 2 or 3 bedrooms and washing facilities (WC, sink, shower). 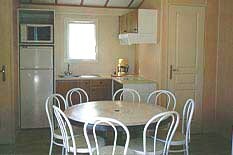 Chalets are available measuring 35 m² and comprise a sitting area, a cooking area, a pull-out double sofa bed. 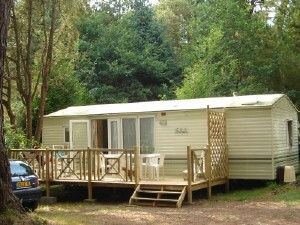 Chalets 1 and 2 have three bedrooms one with a double bed and a cot, separate WC and shower room. 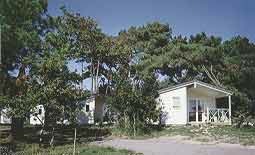 Chalets 3 have two bedrooms, one with a double bed, the other one with 3 beds. 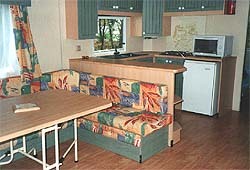 All have a 12 m² covered terrace area.